Christmas is in the air. Thanksgiving gone! Black Friday is Gone! The month of November gone! 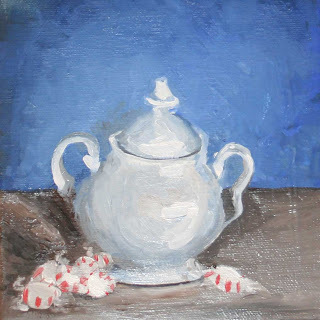 Working hard on Christmas gifts which they are all little mini paintings of still life. So thankfully my mother doesn't know how to use the computer very well and won't be able to check my blog with out assistance. I am trying to paint them fast because I am such a slow painter. So quick quick quick.. like a cheetah. This week I have to go hang at US Bank on NW 23rd for first Thursday in the pearl. So I am totally excited about it and of course a little nervous. There are also a ton of art shows this week that I need to decide what to go to like first Thursday in the pearl and first Friday over in SE. Have a good week everyone! I am so telling your mother about your blog and ruining her Christmas present! Any chance I am on your xmas list!?! I have nominated you for a blogger award. Visit http://livingtheartistsway.blogspot.com to check it out. Can't wait to see you. I hope that you have a great holiday! Careful driving!